“HE’S THE WORST CHILD I’VE SEEN IN 20 YEARS OF TEACHING,” to Ph.D. from Oxford University. When Lois Letchford learns her son has been diagnosed with a low IQ at the end of grade one, she refuses to give up on his future. Testing showed Nicholas had no spatial awareness, limited concentration, and could only read ten words; he is labeled “learning disabled,” a designation considered more derogatory than “dyslexia.” The world of education is quick to cast him aside. Lois begins working with him one-on-one. What happens next is a journey–spanning three continents, unique teaching experiments, never-ending battles with the school system, a mother’s discovery of her own learning blocks, and a bond fueled by the desire to rid Nicholas of the “disabled” label. “Reversed” is a memoir of profound determination that follows the highs and lows of overcoming impossible odds, turning one woman into a passionate teacher for children who have been left behind. Nothing is impossible when one digs deep, and looks at students through a new lens. Lois Letchford specializes in teaching children who struggle to read, working with students of all ages in Australia, England, and Texas. Her creative teaching methods vary depending on the reading ability of the student, employing age-appropriate, rather than reading-age-appropriate, material. Lois writes poetry, empowering her students to see themselves as authors. When her students have been exposed to a wider range of texts, she returns to existing conventional material to re-engage students, who become active, involved learners ready to re-enter the traditional classroom confidently. Several of her most challenging students have gone on to graduate from college. Her non-traditional background, multi-continental exposure, and passion for helping failing students have equipped her with a unique skill set and perspective. Originally a physical education teacher, she later completed a Master’s in Literacy and Reading from the State University of New York at Albany. Lois has presented her work at The Kentucky Council for Exceptional Children, SPELD in Brisbane Australia, and Ireland International Conference of Education. She is a member of the Australian College of Education. 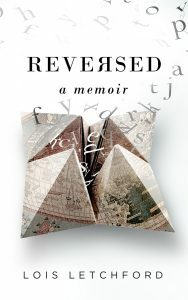 Reversed: A Memoir is her first book.